Below you’ll see a few of my typical lunches. Sometimes, I’ll have a small dish of homemade 24-hour whole milk yogurt and a piece of fruit with my lunch as well. It just depends on what my lunch is and how I feel. Following my photos, you’ll find a few great sounding and looking lunch ideas. 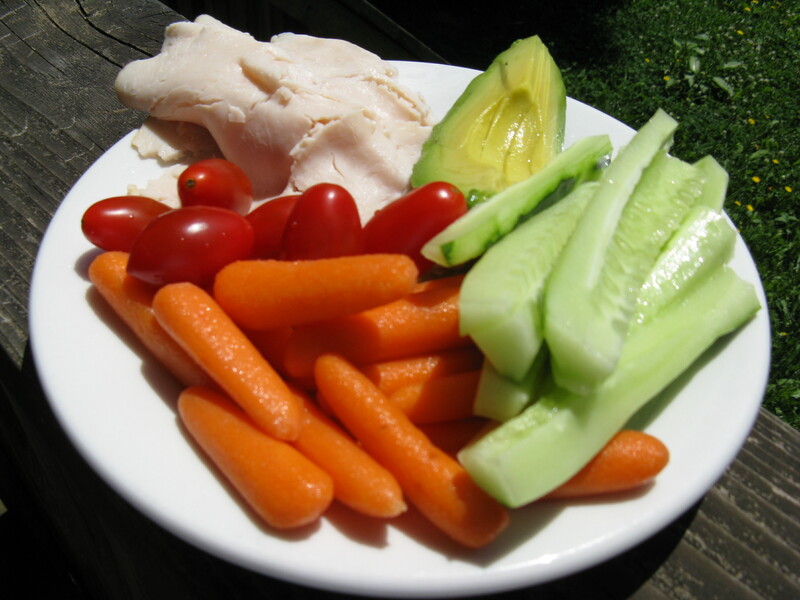 Applegate Naturals fresh-sliced (not pre-sliced) oven-roasted turkey breast, cherry tomatoes, cucumber, avocado and carrots. Two Applegate Naturals grass-fed beef hot dogs, sauerkraut, avocado, cucumber slices, carrots and Dijon mustard. 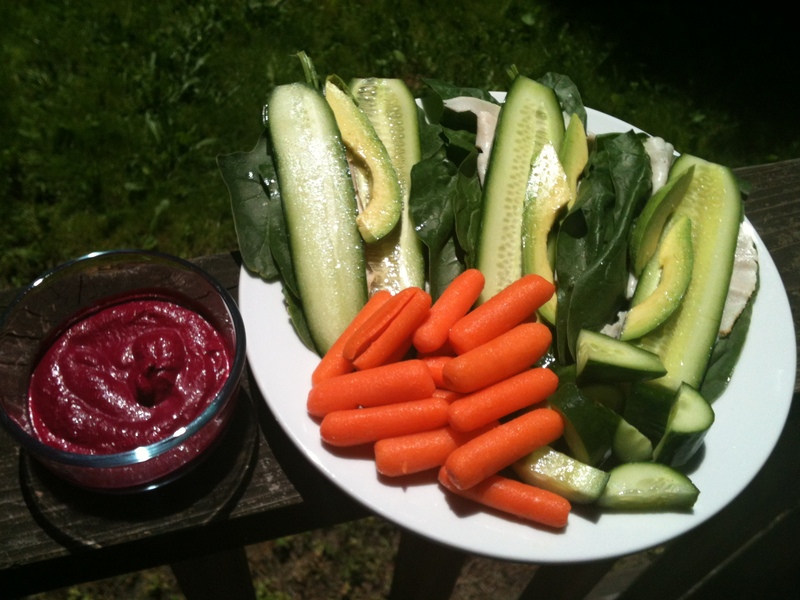 Large spinach leaves wrapped with Applegate Naturals freshly-sliced oven roasted turkey breast, avocado and cucumber slices, and carrots with homemade beet dip (need to share this recipe!). Sometimes I make these wraps with romaine or green leaf lettuce too. 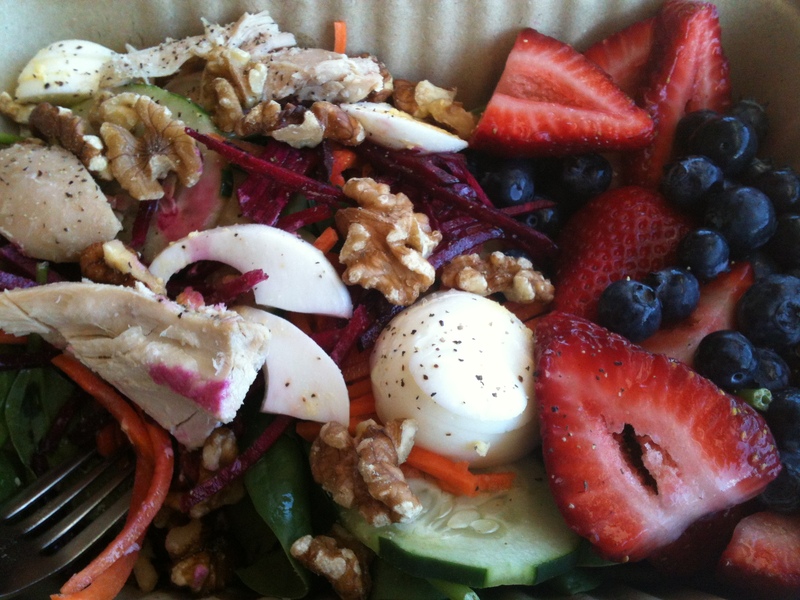 Salad at Whole Foods: spinach, cucumber, carrots, beets, hard-boiled eggs, small amount of walnuts, rotisserie chicken, all topped with olive oil. Also, a side of fresh strawberries and blueberries. Sometimes I buy a few slices of Applegate Naturals freshly-sliced oven-roasted chicken or turkey breast and add it into my salad. It’s cheaper (because of the weight) than adding a bunch of rotisserie chicken pieces! Oh, man, that sausage and sauerkraut and mustard! I need to eat that a lot more often. So luxurious and filling – and simple! I love those flavors. Those turkey avocado roll-ups look amazing, as well. And you’ve reminded me that, next time I have some salmon (or, indeed, just buy some canned), I need to make salmon cakes! Delish! I know, I need to try making the salmon cakes too. The recipe sounds so easy and I think it’d work great with canned salmon! I just left the little market near my office, and I *almost* got some canned salmon – $2.19 a can! – but I wasn’t sure I could trust its provenance. Better wait till my next visit to Wheatsville Co-op. Those dogs look amazing. The DID inspire me to buy two varieties of mustard! Nice on the mustard purchases! I know, canned salmon is a bit more spendy compared to tuna, but I bet it’d be worth it for the recipe. Those ideas are amazing! I’m going to have to try the bacon, egg, avocado & tomato salad! I know, I’m pretty stoked to try that recipe too! I love all of those ingredients! I found some Wild Caught ‘canned’ fish that I can use when I’m out of fresh ingrediants. Tonnio makes Tuna Fillets with Jalapeno in Olive Oil and Tuna Fillets with Oregano in Olive Oil in glass jars. Bar Harbor makes a variety of Wild Herring Fillets in different sauces (canned). Bring on the Omega 3! Good post, lunch is the most difficult meal for me to assemble away from home. Thanks and see you Thursday! I’m glad you like the post, and thanks for the suggestions, Jodi! I like tuna every now and again, but tend to get sick of it really easily. The kinds you mention sound a bit tastier than just plain ol’ canned tuna. I can’t stomach herring or sardines, but I give you credit for being able to eat the little buggers! Sorry, but you won’t see me tomorrow. I’m catching a red-eye flight tonight back to Michigan and won’t be back until late on the 20th. I’ll see you when I return!